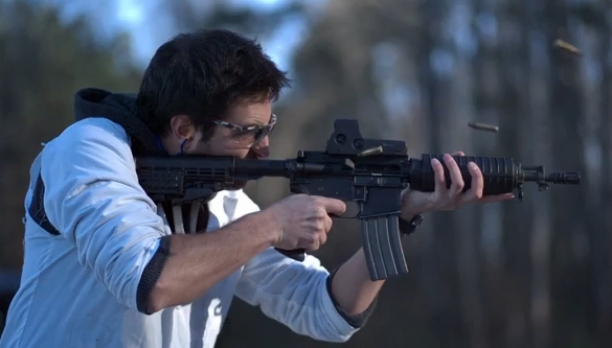 My god, this is by far the best footage of slow motion automatic weapon firing that I have ever seen. Gamers have their own virtual guns, but it does not even come close to this. It is a marvel of beauty to watch this in slow motion. Thanks to the Slow Mo Guys to who made this happened. When Josh Hargis was an Army Ranger stationed in Afghanistan's Panjwai district he came under enemy fire and suffered wounds. He survived his severe injuries while four of his team members were killed. This soldier was given the Purple Heart by the American government. The photo above was sent to his wife that was taken by his commander and the note that came with it is an inspirational message. It took couple of hours after Josh was wounded before he arrived at the hospital to be treated. When he was seen by doctors, he was immediately operated on. Many hours later, he emerged from the ICU at the Afghan base of the US military in severe pain & mental duress. However, he was alert and he received the few Rangers allowed at this bedside. Before he was transferred to Germany where he would be flown back to the US, Joshua was given the Purple Heart. The simple ceremony was held in honor of the wounds that he received in action. Imagine a room full of Ranges, doctors, nurses surrounding the wounded soldier who was confined in bed. The Ranger Regimental Commander presented the medal and pinned it to Josh's blanket. The official orders were published verbally. The Commander leaned over to Josh and sincerely thanked him for his noble sacrifice. The 50 people in the room assumed that Josh was unconscious at that time, but he started moving his right arm in an effort to salute the officer. The doctor tried to restrain Josh because his right arm had all sorts of tubes and bandages over his wounds, but Josh fought the doctor and successfully rendered a salute. That day, the height of emotion which permeated the ICU was truly intense. All the men and women were overcome and began to weep as Joshua's simple gesture spoke volumes about his character. The picture that deserves a place in every newspaper and news channel is now hanging above my desk. For me, it is the greatest event that I have witnessed in my 10 years serving in the US Army. The Boot Monument in Saratoga National Historical Park in New York is an American Revolutionary War Memorial. This commemorative landmark was put up in honor of the services of an unnamed Major General in the Continental Army during the Battle of Saratoga. Although this memorial does not honor anyone in particular, many of those who are familiar with American history know that the officer given the honor is Benedict Arnold. He was an American general during the American Revolutionary War who eventually defected to the British Army. The reason why Benedict Arnold's name is not openly mentioned is that he has become infamous as a traitor to the American people. In the Battle of Saratoga, the Continental Army won over the British Army and his great contribution to this battle won him the admiration of the people who erected the monument in his honor. During the battle Arnold got wounded in the leg near the site where the monument can now be found. The Battle of Saratoga was his last battle. It ended his career. After his treachery became known to everyone, Arnold became the subject of spite. Benjamin Franklin wrote this about Arnold: "Judas sold only one man, Arnold millions." What do you think about this traitor?